Happy Spring Ladies! 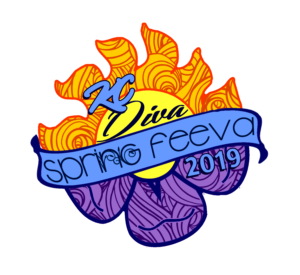 It’s just 6 weeks until we meet again in Kansas City for the 5th Annual KC Diva Spring Feeva. We’re finalizing more details of the event as each week goes by and we’re really excited with the way everything is shaping up. An additional $500 has been added to Pro payout and additional $100 to AM payout. Register on Disc Golf Scene here. If you’d like to play but need assistance with entry fees, please contact us. We have a few entries that have been gifted by generous sponsors. Looking for a place to stay while in Kansas City? For those traveling to Kansas City for KCDSF, Crispian Paul has taken the time to do some research on Air BnB and locating local hosts during the weekend. You’ll find her tips and lodgings options in the post here. Please be sure to thank both our generous course sponsors for their support! Both courses will be available for practice rounds beginning Monday May 6th with the exception of one temporary hole on the Diva Feeva Pink course presented by Innova. The tournament is on Saturday but if your schedule allows, you don’t want to miss out on Friday’s festivities and kickoff to the event. 12pm – 5pm Diva Feeva Doubles presented by Launchpad Disc Golf. This is a flex start, bring your own partner, doubles event. A portion of the proceeds will go to Gilda’s Club of Kansas City. All divisions are offered. Join Ladies of the Chains for a disc golf clinic with Team Dynamic Discs Pro, Cynthia Ricciotti. Prizes will also be provided by Dynamic Discs. 4pm – 7pm Happy Hour hosted by our local Kansas City Disc Golf Club. There will be snacks, beer and music. Come celebrate with us, meet up with old friends and meet new ones. We’ll be setup at the block party Saturday April 27th in downtown Emporia at the 2019 Glass Blown Open. Stop by and say hi! KC Diva Spring Feeva is part of the Heartland Women’s Series- women only disc golf tournaments in the 4 state region, Kansas, Missouri, Nebraska and Iowa. August 10: OWL Open – Oskaloosa, Iowa. Registration not yet open.